Last week was a pretty exciting week for our team, fresh from our first Human Rights Week 2015, which came to a close with the Hong Kong Human Rights Arts Prize 2015 Awards Ceremony and Charity Auction at the Fringe Club. In case you haven’t already heard, the winners of the Hong Kong Human Rights Arts Prize 2015 are here. Thank you to YOU, our supporters, who engaged in Human Rights Week to make it a massive success! It has been wonderful to promote awareness, dialogue and action on human rights around the important occasion of International Human Rights Day. Ending 2015 with such a thrilling event and with 2016 right around the corner, our team has decided to reflect on the many highlights from this past year, below. All of these milestones would not be possible without your ongoing support. With the festive season underway, please consider making a life-changing donation to support our work. Or, ask your friends and family to make a donation to Justice Centre in lieu of giving Christmas presents. Your support is vital in enabling us to provide essential legal and psychological services for refugees and survivors of torture, and to advocate for the rights of forced migrants. Please click here to make a donation today and find out how your donation will make a difference. And why not give your time? Justice Centre is currently recruiting for a number of different positions, including a Communications Manager, Communications Intern and interpreters. Check this space for future opportunities in 2016 and to learn more about our current openings! With that, here’s wishing you and your loved ones a wonderful holiday season! We look forward to seeing you in the New Year! Information to promote access to justice: Justice Centre launched a new information session – ‘USM 3: Appeals and Judicial Reviews’ – to inform protection claimants on the options available to them if their USM claim has been unsuccessful. In a system with a 99.7% rejection rate, this information is crucial. Seeing the impact of our individual assistance: Justice Centre saw one of the beneficiaries of our individual legal and psychosocial support services recognised under the Unified Screening Mechanism – one of only a handful of successful claims thus far in this new system. Justice Centre continues to push for more transparency through Access to Information Requests. Shadow report to the UN Committee against Torture (CAT): Justice Centre submitted a shadow report to CAT, outlining our concerns about Hong Kong’s commitment to fulfilling its obligations under the Convention against Torture. We also helped claimants file their own submission, resulting in strong and detailed recommendations by CAT to the HKSAR Government in November. Hungry for Change instrumental in leading to food policy reform: We did a final push on our Hungry for Change petition, garnering over 1300 signatures that we provided to the Security Bureau, along with letters from refugees and our research on food assistance schemes. This led to a positive change to a food voucher scheme, with restrictions on certain food items also eventually lifted in December. Ground-breaking research on human trafficking and forced labour: Justice Centre conducted, in partnership with a market research company, a first-of-its-kind large-scale survey with over 1,000 migrant domestic workers from 8 countries of origin to estimate the scale of forced labour, human trafficking and exploitation. The results will be published in a report that will be released early in 2016. I am more than a refugee (media project) for Labour Day: On International Labour Day on May 1, graduates from our Voices for Protection advocacy traineeship for refugees came together to discuss their careers, dreams and ambitions, given that they have no right to work in Hong Kong. Since we cannot take their photographs, for security reasons, we recorded their voices instead. Listen to ‘I am more than a refugee’. Justice Centre adds a Senior Legal Advisor to team: We welcomed Adam Severson who took up the new role of Senior Legal Advisor to oversee our Protection Claimant Services team, ensuring that our legal work is of top quality. In honour of ‪World Refugee Day on June 20, we celebrated the accomplishments and stories of ‪refugees, both past and present, at an event at The Foreign Correspondents’ Club, where we also officially launched our #SharedPasts project, in collaboration with Xyza Cruz Bacani. Watch the #SharedPasts video. Advocacy around Hong Kong’s ranking in US TIP Report: Once again, Hong Kong was disappointingly ranked at Tier 2 in the US State Department’s Trafficking in Persons (TIP) Report in July this year for failing to meet the minimum standards for the elimination of human trafficking. Justice Centre issued a media statement, and our Advocacy and Campaigns Manager spoke to RTHK about the report. New Executive Director is appointed to lead Justice Centre: Piya is a qualified Barrister in England and Wales and an Advocate in Scotland, and has been working for the past fifteen years in the field of human rights, child rights and refugee law and policy. Piya most recently worked at UNICEF UK as head of policy and advocacy, and Freedom from Torture as their senior legal advisor. Justice Centre receives funding to launch Voices for Protection WOMEN: Thanks to the generosity of HER Fund, Voices for Protection WOMEN kicked off with a diverse and dynamic group of women. So far, the group have been learning about famous women leaders, about their own roles in society and how they can be leaders as well. Watch out for more updates on their activities! Justice Centre Ambassadors Network kicks off: We launched the Justice Centre Ambassadors Network to offer our supporters the opportunity to get more involved in our work on an ad hoc basis. Our first group of Ambassadors have been busy supporting our activities, attending events and visiting schools. To receive an update when we open our next round of recruitment, please email Zamira at ambassadors@justicecentre.org.hk. Justice Centre welcomes its second Justice Centre Fellow: Our second fellow, Lynette Nam joined our team. The fellowship was created to develop public interest law capacity in Hong Kong, and the role contributes to the provision of Justice Centre’s protection claimant services and the operation of our pro bono partner programme. Justice Centre is a charity beneficiary of grants and fundraising activities: We were honoured to be selected as a charity beneficiary for Operation Santa Claus, organised by South China Morning Post and Radio Television Hong Kong. 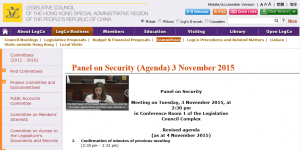 Check out our interviews with SCMP and RTHK to learn more. We also received a grant from UN Voluntary Fund for Victims of Torture (UNVFVT) to provide survivors of torture with legal and psychological support. Lastly, students from schools around Hong Kong fundraised for Justice Centre’s human trafficking research during the 24 Hour Race. Refugees engage in “Run for Justice” with Free to Run: The ‘Run for Justice’ team conquered their 10k and 5k races on November 29. The team consisted of refugee runners, as well as Justice Centre, Free to Run and Macquarie staff and volunteers. Many had never even run a race before! The funds raised have gone towards our legal and psychological work, as well as towards the work of Free to Run to help them organise hiking groups for female refugees in Hong Kong. Thank you to Macquarie for their support and to those of you who sponsored the team! Justice Centre introduces Human Rights Week in addition to Arts Prize: In addition to the Hong Kong Human Rights Arts Prize exhibition, we held our first Human Rights Week, hosting talks and activities to generate awareness and dialogue around human rights! We have limited edition prints of three of the shortlisted pieces, signed by the artists and priced at HK$2000 each: P H Yang’s What Next for Hong Kong; Chi Loy Man’s My Face Hit Your Fist; and Rebecca Benians’ Why? Only one week to go till the launch of Human Rights Week 2015! Are you as excited as we are? As part of the line-up, we’re very honoured to have visual artists Kacey Wong and Katie Vajda delivering a special talk on the use of art as a tool to raise awareness of human rights issues. They will speak about some of their projects and the issues they are passionate about, particularly reflecting on the value of protest art and tips for effective art advocacy for emerging artists. This talk will be of interest to emerging artists, art students and enthusiasts, and anyone interested in activism! Into Wonderland by Katie Vajda. The donated artwork will be auctioned on December 10. 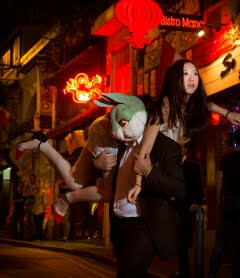 Kacey is an educator and an active contemporary visual artist in Hong Kong. A former judge of the Hong Kong Human Rights Arts Prize, Kacey’s experimental art project investigates the poetics of space between men and their living environment. He was the winner of the Best Artist Award in 2010, Rising Artist Award and Outstanding Arts Education Award given by the Hong Kong Arts Development Council in 2003. 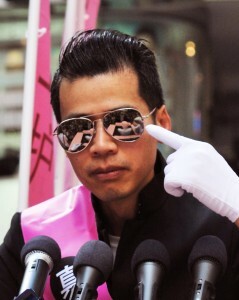 Kacey is well known for using his art as social activism and for his public engagement art projects in the Occupied Zone during the Umbrella Movement. As an art activist, his recent political artworks explore the possibility between art and public demonstration, linking art and political resistance into one. 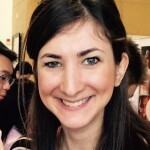 Katie is a photographic artist living and practising in Hong Kong. Her work is beautifully executed yet challenging, engaging with cultural theory and philosophy. Katie’s work has appeared regularly in Hong Kong media and been exhibited both locally and internationally, most recently at Fine Art Asia, The Arts Centre HK and Art Miami 2015. Katie was also the winner of the Hong Kong Human Rights Arts Prize in 2014, with her series ‘Can you see me yet?’. Black Cop Candle by Kacey Wong. The donated artwork will be auctioned on December 10. Both Kacey and Katie have also generously donated artworks that will be auctioned at our invite-only awards ceremony and charity auction on the evening of December 10, which is International Human Rights Day. Venue: The Fringe Club, 2 Lower Albert Road, Central. RSVP by emailing info@justicecentre.org.hk or calling 3109 7359. Check out the full line up of events for Human Rights Week 2015 at www.justicecentre.org.hk/events. 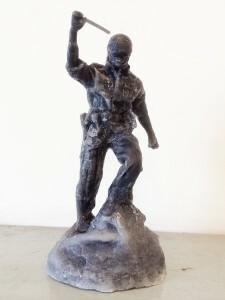 You can now preview the gallery of shortlisted artworks for the Hong Kong Human Rights Arts Prize and pre-bid online at www.justicecentre.org.hk/artsprizegallery. The Justice Centre team is proud to bring to you Human Rights Week 2015 in the run up to International Human Rights Day (December 10)! Human Rights Week aims to provide a platform for the public to celebrate and learn about human rights through the arts, talks and activities for the whole family. The Hong Kong Human Rights Arts Prize is a key part of Human Rights Week. Established in 2013 and organised by Justice Centre, the Hong Kong Human Rights Arts Prize aims to harness the power of the visual arts to promote awareness, provoke dialogue, inspire action and bring about change in the area of human rights. Previous winners have included Filipino photographer Xyza Cruz Bacani, who has just been named one of BBC’s 100 Women of 2015, and Katie Vajda, for her series on domestic workers in Hong Kong. This year, we had the largest number of entries we’ve ever had – over 100 – from which nineteen artworks have been shortlisted for the Prize by a panel of prominent art experts and human rights specialists. The shortlist features works in a variety of media from both Hong Kong-born artists and those originating from countries as diverse as Belgium, Spain, Canada and Mainland China. A wide range of themes runs through the artworks, including last year’s Occupy movement, homelessness, the plight of refugees, forced labour, ethnic minorities, LGBT rights, among other human rights and social justice issues. You can view the Hong Kong Human Rights Arts Prize Exhibition during Human Rights Week at The Fringe Club, December 4-10, from 10am – 10pm (closed Sunday). The exhibition is free and culminates in an awards ceremony and charity auction at an invite-only event on International Human Rights Day, December 10. Preview the exhibition, as well as pre-bid for your favourite pieces online at www.justicecentre.org.hk/artsprizegallery. We look forward to celebrating Human Rights Week with you! Check out the line-up of events for the week below and RSVP by emailing info@justicecentre.org.hk or calling 3109 7359 stating which event you would like to attend. See you there! All talks and activities will take place at The Fringe Club, 2 Lower Albert Road, Central. A fun-filled morning for children to learn about refugees in Hong Kong through art, story-telling and games. Suitable for children aged 3-10 and their parents. Admission: HK$100 suggested donation per child. Each child MUST be accompanied by an adult. Limited places. RSVP essential. Learn about how Kacey Wong uses his art as social activism. Kacey Wong is an educator and an active contemporary visual artist in Hong Kong. He is well known for using his art as social activism and created public engagement art projects in the Occupied Zone during the Umbrella Movement. Learn about human trafficking and forced labour as it relates to migrant domestic workers (helpers) in Hong Kong. We are happy to organise group visits for schools to view the Hong Kong Human Rights Arts Prize Exhibition. If you would like to arrange a school visit, please contact us at info@justicecentre.org.hk. Please note the exhibition is suitable for Years 6 and upwards, at the discretion of the school/teachers. 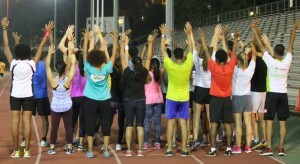 This week we are excited to have Virginie, from our partner Free to Run, blog about her experience of organising hiking and track training groups for refugees in Hong Kong. Free to Run is an NGO that aims to use the power of sport to change lives and communities in areas of greatest need, particularly to empower and educate females in conflict-affected communities. My grandfather was a refugee from Hungary who went on to live in Belgium and had refugee status for almost 30 years. He had survived terrible deprivations, amongst them several years in a Russian gulag (forced labour camp). The effects of his experiences on his personality left a profound impact on me: he never locked his house, should anyone need shelter. He invited every street vendor into his home, and said that when everything is taken away, only kindness and love is left to share with others. My grandfather passed away as I launched my career as a corporate lawyer in New York, but my pro bono work was often refugee-related, letting him slowly back into my life. Three young kids and moving around in Asia made me re-evaluate my career, and I have not looked back since starting to be involved with Free to Run, which I heard about through its founder, my friend Stephanie Case. This formidable NGO creates and supports an environment for women and girls in conflict zones, like South Sudan or Afghanistan, to participate in sport and physical education. Free to Run also reaches out to women and girls that are escaping war, torture and human cruelty. Very recently, I worked with two amazing Afghan women to participate in a 250 km self-sustained race, and we crossed the finish line with them as the first Afghan ultra-running team. Free to Run is now a new way to see life for me. 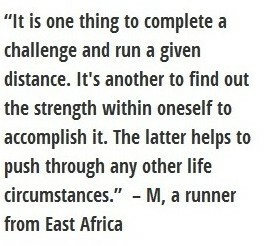 I truly believe that running and hiking is extremely empowering and can help anyone overcome their past and troubles. Refugees, particularly female refugees, don’t have a chance to access much sport or physical activity in Hong Kong. It’s usually the women who have to be home with the children, who are here as single parents or who, for cultural or language reasons, may find it difficult to access public space. Also, many of these women suffer from mental trauma as a result of their experiences. This is why, in June this year, together with a bunch of tireless Free to Run volunteers, help from the Hong Kong running community and Justice Centre’s support, we launched two initiatives: a “Hiking to Heal” programme for 20 refugee women and a mixed gender ‘Run for Justice’ track-training group. From the trainings, it’s been amazing to see that the participants in both the women’s hiking programme and the track-training group seem happier; they seem healthier; I think they feel they can enjoy the moment and not worry all the time about their legal case or what will happen to them. It structures their week and gives them a goal to work towards. I am so proud to announce that these wonderful athletes will be participating in their first 10K running race on November 29, and more hiking programs mainly for refugee women are in the starting blocks. They are raring to go, but they need your support! Please visit the Run for Justice JustGiving page, sponsor them and share within your networks. Funds raised will go towards Justice Centre and Free to Run. It is true that working with refugees means also letting them into your life, and during the hiking and running activities, we share our joys, frustrations and hopes together as true friends. The refugees that I have met through those programs have a pure kindness that is sometimes hard to find in our overly materialistic world. Having experienced the worst, they know the real meaning of love. They humble me to the bone, and truly deserve the best of life. Free to Run just tries to help them to run over the starting line of a new life. Join us in cheering for our superstar Run for Justice team – donate via the JustGiving page, leave them words of encouragement and share! 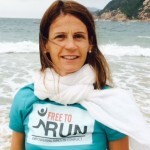 Virginie Goethals is a Belgian mum, a lawyer and is on the Board of Directors for Free to Run. She is also a keen distance runner.